So many familiar faces sharing their life stories. I only wish the night was longer and I could have talked to everyone. I'm grateful to the tireless planners for a fabulous party. Al Seamans is alive and well in Sacramento. He was not aware of the reunion. Go to his Classmate Profile and send him an email! From its inception to the Big Night, from the splendid website to the flawless hot band and comfortable environs of the Hilton, the Reunion Committee did an absolutely wonderful job of putting it all together. Thanks again! I hope the Committee doesn't mind if I say on their behalf: all of us do so very much appreciate all of the kudos. Honestly, nothing could be more rewarding than believing that everyone who attended had a great time. For myself: the evening wasn't long enough. There were many with whom I did not have the opportunity to visit. If time could have but stood still for a few hours... Party on, class of '69! Make the most of today ~ but remember yesterday, for it played a part in determining who you are. As for tomorrow? I hope, for all of us, that the best is yet to come! 70 to your reunion. Wish more folks could of attended from those years. Guess they had no idea what a great party it was going to be!! Really nice to see and visit with old friends. to Chuck for inviting me up to play with his band. It was great fun and the place was rocking. Thanks to the many classmates who sent emails, posted messages to our Message Forum page, and even made phone calls to thank us for our work on the reunion and expressing what a great time they had! Wow! The response has been incredible! Believe me when I say YOU having a good time is what makes US feel it was all worth the effort. Can't wait until our 50th to do it all over again (with even more experience under our belts!). I was so sorry to miss the reunion. I'd been looking forward to it for months but time and family things made it impossible to manage this year. I'll be making a total effort for a 45 or 50 though! I have to say this website is an awesome way to keep in touch though ... great job making it so easy to navigate and with so many wonderful memories stored like treasures. I got to spend a day with Lesley (Schoenberger) Harrison two weeks ago at the Friesian National Horse show in Reno, Nv. We sat there watching the horses and I looked at her and asked if she remembered what a good idea we'd thought it would be if we got permission to be Encina's *mascots* because we had horses. Sharon, so sorry you were unable to make our 40th reunion. We will definitely look forward to seeing you at our NEXT reunion though! So glad you enjoy our website. After I get all the updates done on our website for our 40th reunion, I'll be sending out a survey to everyone asking if they'd like to continue our class website. Be sure to respond! I'd like to continue to support it if that's what most of the class wants. Thank you Leslie Ardell (Maxwell), Lynda Benvenuti (Taylor) & Chris Taylor, Alan Dankman, Steve Finegold, Debbie Friedlander (Brans), Chris Harrold, Kathy Maurer (Wright), Janet Ralph (Douglas), Allen Seamans, Mike Shower, and Gail (Laura) Vanneman (Warren) for attending our Encina Class of 1969 Mini 41st Reunion at Piatti's Restaurant! AND thank you Laura for providing all the yummy hors d'oeuvres for us to munch on before dinner! I had a wonderful time seeing and catching up with all of you. Many of you requested we get together more often (at least once a year in between our bigger reunions). I must say that Piatti's Restaurant did an excellent job accommodating our group. I give them a 5 out of 5 stars! Unfortunately, my pics of the evening didn't turn out well. If any of you that attended took some nice pictures, please contact me through our class website so I can arrange to have you send them to me to post to our website. Thanks again to all of you for a wonderful evening! What a time we had! And, I must say, it's the first event where we've had PARTY CRASHERS! Oh no, wait...I remember now that we had two young ladies crash our 40th class reunion. Proof that we know how to have so much fun that others want to join in! Anyway, I just wanted to let you all know that you make the effort of pulling these events together worth it! I always enjoy myself and feel fortunate to know such a special group of people. 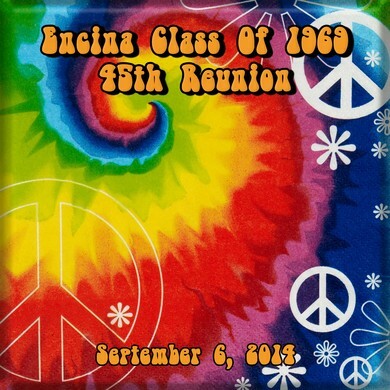 Encina Class Of 1969 45th Reunion! What a BLAST! Thanks to everyone attending on September 6th and to all those wearing their "Groovy" threads! I know Deborah, Alan, and I had a "Far Out" time even with all the stress of putting on the event. Every bit of all the hard work that went into pulling off this reunion was worth it when we saw all the happy people and heard all the positive comments. If you attended this very special event, share your thoughts on our reunion by adding your comments here on our Message Forum. Hi Chantelle. Thanks for all of your hard work, the 45th was an outstanding success. Many of our classmates were very interesting in their period dress, the evening was full of lots of laughs. One of the best reunions to date, now where did I put my reading glasses. Bye for now. Thanks again, Brian Vaughn. I so sorry I could not make it to the reunion, but I had a very crucial BBQ competition that day. My BBQ team is now ranked 25th overall out of over 200 teams in California. As of now we are in 1st place in California for RoY ( Rookie of the Year ). I'm getting the team ready to head to Dana Point where 120 pro Pitmasters will compete for $30,000 in prize money. I have some good pix of classmates I'd like to send to you. Tres bien! As Mr. Psiahas would say. It is so grand to be able to dance, laugh & enjoy one another, especially when many of us have certainly met some tough challenges in this phase of life. Kudos! to those of you who travailed (also as Mr. Psiahas might say, but in French) to offer this opportunity to gather together with people with whom we've shared special portions of our life! Photos later; I am not quite as hep to the jive as Chantelle! 45 might have been the best yet. It was great exchanging stories, dancing and renewing old friendsips as well as starting new ones. The band selection was right on and they kept the crowd on their feet most of the night. It is a cliche but it's true: they just don't make music like they used to. As I listen to the gift cd, my mind drifts back to our wonderful night in September. 50 is the big one, so let's lobby our missing friends and get them to show up in 5 years. The committee trio outdid themselves and now the challenge is to make 50 an epic event. I just hope I'll be able to remember it! Thank you again to the reunion committee on a job well done. We should all connect more often! I had planned to join you all on September 6th for our 45th reunion. But life got in the way. My Mother passed away two weeks ago. So not a good time for me to join in. I bet it was a great reunion. See you in five! Sorry I missed the 45th reunion, thank you for keeping all of us in touch. The party looked like it was a lot of fun! Seeing all that tie-dye made me think that some of our classmates might be interested in Rosie McGee's website, book, photos, etc. She's an amazing woman – we worked with her briefly on the "Marin Rocks" project for the Marin History Museum. Knowing someone who was deeply in that time, and has great memories and stories, has been a privilege, and a connection I'm happy to share. Click on the following link to check out her website: http://www.rosiemcgee.com. Hope to see you all at 50 or before. To all of those who helped to make the 45th Encina Class Reunion a special night to remember, my sincere thanks go out to you!! Chantelle, Debbie and Alan, you did a wonderful job!! Everything, every small detail, was so well thought out and so much fun. The perfect Sacramento summer weather added to the graciousness of the evening and it was easy to relax among people I haven't seen in 45 years! Wow, now that was an accomplishment. Also, a special thanks to the donor(s) who underwrote this event with generous funding, so that we were able to attend at a reasonable price. This was very lovely indeed. 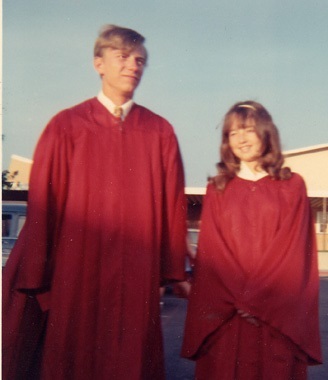 My best to all of those who were in the class of 1969, and their spouses and friends. It was a pleasure to see you. I look forward to the 50th! I can't think that the planning of an evening like this can be topped! To those of you I saw, it was wonderful to reconnect for a few hours. To those of you I missed after the dinner I wish I would have stayed. We are all so fortunate to still be alive and apprieciating life. Looking at the lists of those who have passed amazed me. They were all far too young to pass so soon. My thoughts and prayers to them and to those of us who are still alive. Thanks to all of those folks that made the reunion happen. It was a pleasure to take part! Thank you very much! PS - To any who knew my father at Encina, he passed in 2001 at age 85. He cherished his years as a teacher. Reunion is for retaining, refreshing and creating new memories with a group of people who grew up in your time and world. My kids when taking US History were shocked when I told them, I was there in person 1969 AD. Rock music, Civil rights, Woman's rights, Vietnam, Moon landing, computers, so much happened! Thanks to the Reunion Committee for a terrific evening and the donors who pitched in the extra money. In particular Chantelle who made even the "shadow" students feel welcome. Everyone, thanks for your open, friendly and engaging evening.